I was very excited about these modernized stories as they promoted moving out of gender stereo types, removed the scary aspects and were in a modern setting. 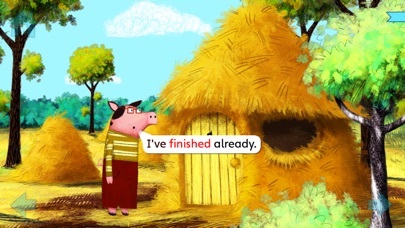 So, I downloaded The Three Little Pigs. It was HUGELY disappointing and appalling from the start: 1. Mom is vacuuming while dad is watching tv. Looks like Leave it to Beaver. Decidedly not modern. 2. Mom says it is time for kids to go out into the world on their own... KIDS! What little kid goes out into the world on their own AND builds a house? 3. The littlest boy says it will be an adventure, the middle girl says she will do all the cleaning if she can stay home and the oldest boy asks who will wash his sock. What?! Hello old stereotypes! 4. Each pig builds a house with no effort and no help. The girl pig says her “tiny house” is cute. More old gender stereotypes. The youngest pig builds a huge three story brick house... with similar effort as others... just throwing up the materials that becomes the house. Where is the cooperation of helping each other? Where is the point of the story about the laziness of building quick is less durable? 5. 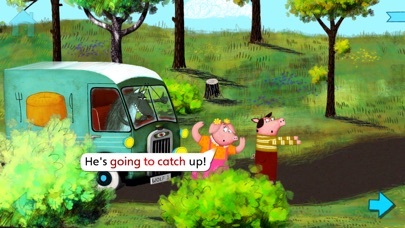 The wolf in a cake van with no windows chases the pigs. Scary child abduction scenario. Why is the Big Bad Wolf still portrayed as a middle aged guy and why make him look like a child abductor? 6. The wolf goes down the chimney and scalds his bottom in a pot of hot water that is being cooked over a wood burning kitchen stove. How is that modern? At least he doesn’t get cooked. This story is ridiculous and I cannot believe I spent $5 on it! Also a very traditionally linear story line and uninteresting digital interaction. My child will not be watching/ reading this as it has many terrible undercurrent messages. The original has a better message. Beautiful art and great interaction! My kids love this interactive story! It's a classic, but it goes the distance and will never get old. Each page is packed with things to do. I also like the different reading options. My older daughter can read it herself and my younger daughter can listen to the narrated version. Definitely one of our favorites. My kids loved this. They are 4, 2 and 1. I love the pigs accents too. Very cute! One of the best apps I've seen in a while! While I feel like a buy a new app ever 20 minutes that is worthless, this one is incredible! Fantastic quality and visuals, the kids LOVE IT!! highly recommended!! Just bought this app and it keeps crashing when the wolf is chasing the first pig. Restarted it three times. Very disappointed. My son loved this one. He likes the in app fun with all the characters. 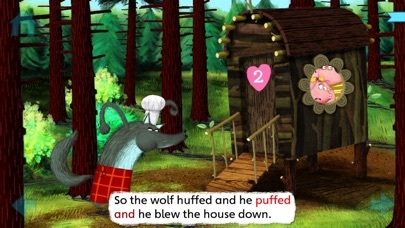 My 21 month old daughter loves this story app! Nice 3D design. My 3-year old daughter loves it! The kids really enjoy this app but it's kind of expensive of an interactive book. This is the best app that I have purchased to date! I had hesitated because of the price but it is well worth it. So much interaction and as a result it is different each time. My daughter has cerebral palsy and many apps have the home page and other stuff positioned in areas that get touched so much so she is always getting "stuck" and this app does not have that problem. Thanks! Very one dimensional. Graphics ok but interaction was limited. Not worth the money. Lots of interactivity in this one! Both me and my 3 year old both enjoy this app! And I love the 3D aspect!! The story, art and animation are first class and lots of interactivity. One of our faves. My 3yo absolutely loves this app! We've had no problems it's it. The 3D like graphics are so cool and there are fun little hidden antics. Definitely recommend! One of the best apps we have for our daughter. Love it!!! My son can't get enough of this game! Very well put together, a top quality iPad book. Great app. My kids love the story, but not as interactive as other apps we have. The 3d part is great. Crashes a lot but soooo worth it! This is very good quality book with just enough interaction. Beautiful graphics, quality sound. My 2 year old doughtier keeps coming back to it all the time. This book really sets a standard. Do not hesitate, it's awesome! My 4 yr old granddaughter loves the 3 little pigs. This is a great version with characters that she can interact with. Lots of fun!! This is one of our favorite books. You can tell it is a good one when we have to read it over and over again. It is interactive. As a teacher, I do rate it as a superior book for kids! This book is so creative and engaging in the way it tells a familiar story. My girls love it. 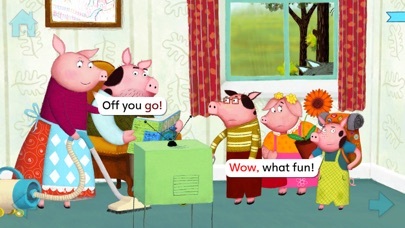 My 5 yr old LOVES this telling of the three little pigs. It's very interactive and she's loves that she can make the pigs say different phrases. Very Cute. Will not work on iPad Air. Loads to main screen but none of the buttons work. I touch every button but get no response. It looks to be an awesome app and look forward to an update. Thanks! App never crashed, awesome graphics. I liked this presentation of The Three Little pigs a lot. 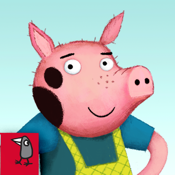 I've read a number of books where the first two pigs were eaten. I work with young children who really don't need that violence in their lives. Nice graphics and very clear pronunciation. .
Great interactive features, beautiful graphics, fun story, engaging characters. One of our favorites! We love this app, and we love the new text highlighting. However on smaller screen devices like iPhone 4s an iPod touch, the words are connected with no spaces. It works fine on iPads. Please fix this. Thanks. Funny, wonderful animation and the best revamp of this tale. Exquisite graphics. Nosy Crow you are in a league of your own. Love this app! Wonderful interactive kids love when studying/ comparing fairy tales. A huge hit. This is what an iPad story book should be! Absolutely tremendous for my two year old. (My six year old enjoys reading it to him as well). Easy interaction for the little ones. Fantastic look and perspectives. Melds the traditional story book to new technology perfectly. Can't wait for more from these folks. A must buy if you have young children. This is a beautiful well thought out storybook! The graphics are wonderful. The narration is sweet. My little boy who is two loved it and sat through the whole story. I enjoyed this with my kids. My kids at home and my kids in speech therapy love this app. I do think it's a little pricey but it's a great app with lots of language therapy opportunities in it. We've had the app for about as long as it's been available. My daughter still loves it. It's definitely more fun than simply reading the story. I am a kindergarten teacher and this app is great! I will for sure use it with my students and recommend it to others. Will be watching for more stories by you. My grandkids cannot get enough of this story. It has to be read first before any other story is read. I love the vivid colors and how all the piglets work together. We always are emphasizing working together to the kids and this story seems to be extremely supportive of this also. Thanks so much. Finally....an app well worth it's price! Great animation, interaction, and graphics. Gets and hold the child's attention. 3d quality is excellent. This is a must have app! There is very little guidance for a young child to move through either this or Little Red Riding Hood. 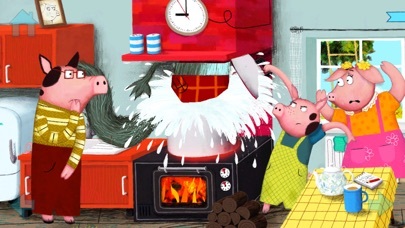 Worse, on The Three Little Pigs, the ribbon in the upper right-hand corner which shows all of the illustrations, includes at least two that aren't featured in the story--the wolf climbing the ladder to the roof and the wolf hitting the boiling water. Plus, it's a stove, not a fireplace. This is not something I, as a teacher, can give to a young student and expect her to get very much out of it. If it were an actual book I would return it. Definitely not worth the price. This is a great app! The graphics are wonderful and interactive. My students love to hear it over and over. It is great for working on vocabulary, verbs, semantics, sequencing and story retell. I hope Nosy Crow will come out with more stories!